Padang Bai port located in Karangasem regency. This port becomes berths leading to and from Lombok, and East Indonesia. This port is not the one that connects Bali to Lombok, but is nearest to Lombok. Padang Bai port conditions are very bad. Very few facilities for passengers. Many parts of the damaged pier. Also, the number of dock considered less, while the number of passengers very much, dock becomes very congested by passengers passing. Also ships that will transport passengers have to wait in line and waiting in line with other ships that want to carry passengers. Some of the existing facilities is also very old and starts to break down. Rusty iron, potholes, waiting room for passengers is also very bad, looks dirty and rundown. Though this port is also a tourist attraction for foreign tourists, but the manager did not care about the condition of the port as the port. Padang Bai port is only suitable for the transport of goods and vehicles. Trucks from Bali and Lombok use this port to cross. 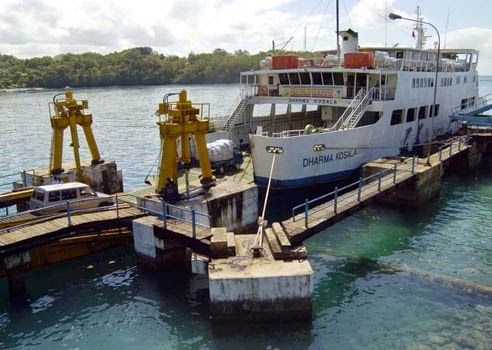 Large trucks and buses who want to cross Lombok from this port. If seen in the harbor conditions, this port can be ascertained only suitable for freight cars, trucks, buses, and goods. Not feasible to transport humans. The area around the port of Padang Bai is a tourist area. Beach with white sand, the sea water is very clear, many tourists sun bathing on the beach around the harbor. Sometimes there are tourists snorkeling around the port, because the sea in Padang Bai has a very nice coral reef. Should governments and port managers of Padang Bai improve facilities and services to provide comfort and safety to passengers. Also be a good attraction for tourists, because this port is located in the area of ​​international travel. Due to poor condition and is not considered suitable for passenger port, transporting humans.